So here I am at Cho Cho San in Potts Point. 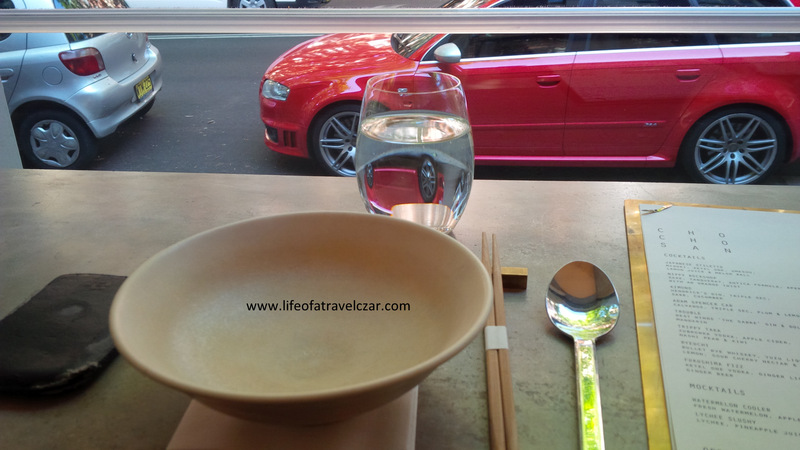 Its a newish Japanese restaurant that has got a following, is often packed and is raved about by the Sydney foodie set… but I always reserve judgement until I experience it myself and Friday was finally that day! Its got a minimalist decor, think white walls, basic timber stools and a white/cream bench top. I find myself a beautiful seat next to the window in a quiet corner. I order a cocktail to start. The cocktail has Midori, Ketel One vodka, Umeshu, lemon juice and a delicous melon ball. The supple melony taste of the Midori, is mixed with the Umeshu (a Japanese plum wine) which provides a streak of sweet and sourness while the overlay of the citrus tang from the lemon juice rounds out the drink. The drink is really a fusion of different flavours with the Midori being the star. I then fish with my tongue the melon ball from the bottom of the martini glass… it’s oh so cold and has absorbed the cocktail. It has an interesting taste and just sends a shiver down my spine. I am finally able to disengage from the world and cast an idyllic gaze over the street and watch the beautiful people of Potts Point rush home from work to kick-off their weekend … I am reminded of that Michael Gray song “I can’t wait for the weekend to begin”. This dish would have to be the definition of simplicity. The beautiful soft rich fatty pieces of ocean trout mixed with a rich soy dressing, spicy black pepper and of course the wasabi. The oils from the ocean trout escape as the trout just melts in your mouth. It’s a sensuous experience as the smooth sweet rich oily sensation of the trout is met with the light salt of the soy, the bite of the pepper and then finished with the hot grip of the wasabi. A fusion of delightful flavours! I love it. I had my heart set on the Cullen Mangan Sauvignon Blanc Semillon (which I tried later anyway) however the host talks me into a Japanese dry white wine. I agree to his suggestion. The wine has subtle aromas apple and peach with light hints of herbs. On the palate the wine flows through with very gentle fruit flavour, some vibrant acidity, discernible peppery spice flavours and a slightly bitter finish. The host is correct, the wine is perfect for the dish, as it cuts through the fattiness of the trout and hints of spice of the wine does reasonates with the spice in the dish. This dish is about contrasts… I couldn’t quite describe it any other way. There is the crunchy outside portion of the omelette which has felt the wrath of the fry pan, then the gelatine-like egg white texture on the inside with a mix of sticky runny egg yolk with the powdery texture of some of the egg yolk which was fully cooked. You have the super succulent flaky crab meat which retains the full flavour of the crab and the gooey Japanese curry which provides a beautiful spicy flavour to round out the dish. The wine is from my home state and I just love Cullen wines (I tried the Cullen Diana Madeleine Cabernet Merlot on a flight from London which just increased fondness of this vineyard. You can check it out here). The wine has intense aromas of lime and pineapple. On the palate, the lime and tropical fruit flavours continue to shine with hints of spice and sweet. A delightful acidity in the finish ensures it has a lovely crispness to go with the richness of the crab and egg. The dish captures my heart the moment it is laid in front of me. The soft and succulent wagyu has the firm smoky charcoal seared outer section which contrasts beautifully with the textures to the rarer middle portion of the wagyu. The juices of the wagyu are indescribable and simply flow through my mouth painting my tongue with the rich oily flavours of the marbling. Then the sweet soy glaze which, well I just couldn’t describe how beautiful it was, provides a sticky sweetness to the dish. I do pair a couple slices with the wasabi and chilli powder to adds some bite, but let me tell you this dish works on its own. The wine is real mix of flavours. The beautiful deep dark red liquid oozes a variety of aromas of ripe blackcurrants, cherries and plums. These continue through to the palate with the full the rich black fruit flavours and spices and some oh so light hints of herbs, while a light (subtle) tannins to appropriately balance the full fruit flavours. Its such a lovely wine with sufficient “meat” that offer a reasonable pairing with the wagyu, however this place doesn’t offer a large variety of deeper meatier red wines by the glass. Then I am convinced to try some sake as a lovely post dessert tipple. I am not a Sake fan, but I am always up for new things and the host does recommend this. Its a light sweet sake that has hints (not overly powerful) of banana and palm sugar with a very clean finish. There is a gentle charm to it as the evening unwinds and the restaurant chatter grows. As the night draws to a close I have another glass of the Pittnauer Pitti while the breeze of the spring air fills the restaurant. Its been such a wonderful dinner of simple produce, wonderful fusion flavours, creative wine selections and something a little different… I love this place.